Finding better, more efficient and more profitable ways to produce parts and keep a competitive advantage is a daily pursuit at successful shops. It’s no different at Task Force Tips (TFT), Valparaiso, IN, which makes multiple different size and design nozzles, valve bodies, and other components for fire suppression and water delivery equipment for the forestry, municipal, and industrial firefighting markets as well as for aircraft deicing. As a result, TFT does many short runs of hundreds of different part designs. Within its fully integrated production plant, about 98% of the work is done in-house by more than 200 employees. It is a very team-oriented workforce which is encouraged by President Stewart McMillan to think of better ways to do what they do. And he has recently invested in a range of automatic lathes from INDEX Corporation that create opportunities for programmers and operators to come up with better processes. “The INDEX machines have made a fundamental shift in how people think in the machining side of TFT,” said, Pat, a TFT manufacturing engineer. “Even the biggest skeptics come over and marvel as it turns out the parts in times that we thought not possible with accuracies that we did not think possible. Our programmer has it set up so that at most we are changing three tools for any job that runs across it and we have made a ton of different parts now. “We are very happy with it far beyond the production levels. There are so many features of the Siemens control that when tied to Esprit software, it became the easiest machine to setup of all our mill-turns. Our programmer has told us that when he looks at a part that he does not think will run faster on the INDEX machines, he ends up cutting the time in half. And when he sees a job that is well-suited, it cuts the time by as much as 70 percent,” Pat said. “For example, one of our new products, a part from our world-beater G Force nozzle, prompted a move to the INDEX , taking the cycle time we had from 14 minutes per part to 6 minutes each--and we think we can get it to 4.5 minutes, thanks to the capability of the INDEX,” Pat pointed out. “From watching the machine run, I believe it’s because this machine hesitates less when “thinking”, and I know it’s also because the spindle sync/pickup and spindle acceleration in the cutoff cycle are significantly faster. I was not expecting to see such a difference in cycle time,” Pat said. HOW THE MACHINE MAKES A DIFFERENCE. According to INDEX, many of the so-called Swiss machines working today are actually making fixed headstock-type parts in the 1-1/4 in. range. 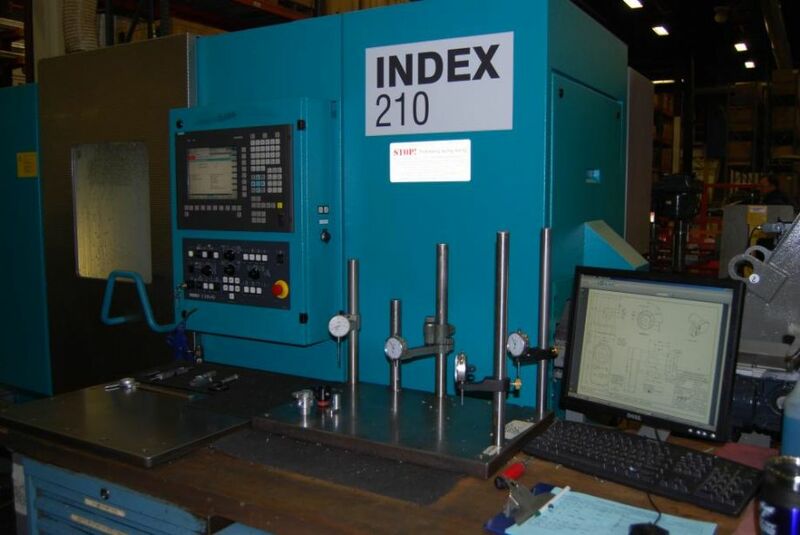 Although the Swiss-style machines are built to handle this bar size range, it is a misapplication of the Swiss-style sliding headstock technology, so INDEX developed the C series machines which offer greater tooling variety, high precision, more power, and faster processing speed, plus greater flexibility. The C machines can be provided in either of two spindle sizes: 65 mm and 90 mm bar capacity. The main and counter spindles each feature a maximum speed of 5,000 rpm (4,000 rpm on the 90MM machine ). With three independent tool turrets, the C200 provides up to 42 driven tools to handle the increasing workpiece complexity, and two Y axes each with 100 mm travel allows TFT to achieve an enormous increase in productivity through an ideal division of machining tasks. All tools in the three turrets are equipped with the INDEX W serration, an INDEX-specific improved VDI interface that is extremely accurate and repeatable. “We preset the tool offline. W-slots in the tool turret ensure repetitive accuracies of +/- 8 µm during setup even with angled tools – and at a distance of up to 100 mm from the tool mounting device,” Stewart said. The INDEX SingleSlide plate-type slide system has proven its effectiveness. The tool slide for X and Z movement consists of a single piece and does not traverse the turrets on anti-friction guides, but on flat slideways. Tool carriers 1 and 2 slide on slideways that are firmly fastened to the machine bed. The virtually wear-free sliding pair consists of through-hardened steel tool plates (slideways) and coated sliding elements (tool carrier). An exact adjustment ensures zero backslash of the sliding pair. This design combines the known advantages of slideways – such as good damping properties and high rigidity – with good acceleration and rapid traverse values, achieved until now only in machine tools based on linear slideways. The system also assures low heat transfer and high accuracy of the machine. Because of the low masses to be moved, accelerations of up to 1 g can be obtained. “The rigidity of the machine due to this design is outstanding,” McMillan said. High working travel of up to 50 m/min guarantee low non-productive times and thus further reduction of cycle times. The vertical machine bed allows a free chip fall and is provided with completely enclosed guards with height-adjustable operating panel. From the viewpoint of training, operating and setup, this machine is immeasurably better, TFT says. There are several conditions which must be met before the machine allows a cycle to begin. Before, on other machines, this meant a machine would sit and the operator would have to decipher why. Now, the INDEX machine not only informs the operator what is wrong, it offers to fix the problem(s). Beyond that, navigation and operation of the control is much simpler and straightforward. SAVINGS IN MATERIAL, BETTER QUALITY PARTS. A great example of how the INDEX C machine saved time and material is on a part for an automatic nozzle for which TFT had been buying extruded stock. 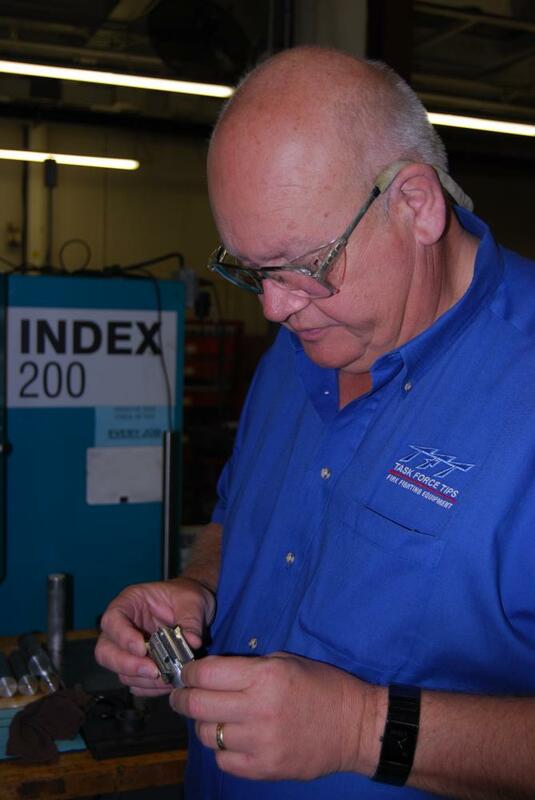 “Our B580 nozzle part had been made for about 38 years from a soft extrusion with fins which we had to inventory. One day one of our operators, after seeing what the INDEX could do, suggested making the part out of bar stock, fins and all. It sounded like a crazy idea, but it was crazy like a fox. Summing up why TFT has invested in what seemed like an expensive line of machine tools, Stewart said, “The more sophisticated the equipment, the more important the people become because it is the creativity of the people that is going to make the machines do things that other people cannot or will not do.